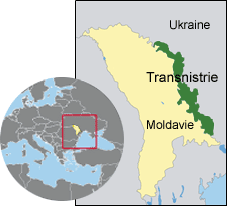 Transnitria is a part of Moldavia which self-proclaimed itself a republic. It covers 4163 km² between the Dniester River and Ukraine. At the dissolution of the Soviet Union, Moldavia declared its independence with the willingness to get closer to Romania. Russian and Ukrainian people from Transnistria expressed their discontent and claimed for autonomy. In 1992, a civil war started, Transnitria being supported by the 14th Russian army which was still stationning there. By fall 1992, the war yielded a special status for Transnitria against Russia neutrality. Today, Transnitria looks like a full state, having its own constitution, flag, national anthem, capital city (Tiraspol), currency, president, parliament, army... Still, it is not recognized by any nations, no even by Russia. It is under Igor Smirnov's authoritarian ruling. It is the place of many trafficking, including arms dealing. Power is mainly within the Smirnov family's hands which protects Russian interests and keeps power by using repression. Transnitria first ruble banknotes were issued in 1994. They were Russian notes with a special stamp sticked on them. They were replaced in August 1994 by the second ruble, worth 100 earlier rubles. Heavy inflation led to the third ruble in 2000, one for one million second rubles. At that time, the first Transnitrian coins were minted. All Transnitrian coins show Transnitria coat of arms. 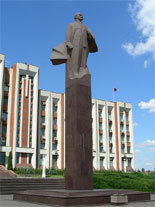 It is derived from the former Moldavian Soviet Socialist Republic. A blue strip was added, symbolizing the Dniester River. The coat of arms includes the rising sun, the hammer and sickle, communism's emblem, plentiful of fruit and cereals, a star. A ribbon displays the states name - Pridnestrovian Moldavian Republic - in three languages which are, left to right: Russian (Приднестровская Молдавская Республика, ПМР), Moldavian (Република Молдовеняскэ Нистрянэ, РМН) and Ukrainian (Придністровська Молдавська Республіка, ПМР).